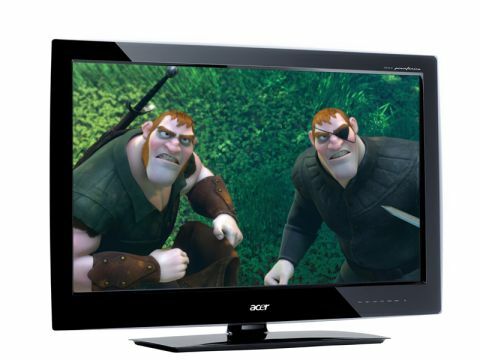 At 23in, this new LCD TV from Acer enters a competitive, saturated area of the flatscreen market. Perhaps with that in mind, Acer has called upon the design talents of Italian automobile expert, Pininfarina, to give it an edge. In that regard it certainly succeeds, with the screen sat in a curved, black gloss bezel with a translucent trim and an illuminating blue strip on the bottom. Pininfarina, however, appears not to have been consulted about the remote control, which is bland and plasticky. Neither is the way the stand and TV meld together going to win any design awards – the holes where the three screws need to be fitted are at the bottom of ridiculously tight crevices. Connections are acceptable at this size and price: two HDMI inputs (one side-mounted), plus the regular analogue fallbacks. There's also a USB point for multimedia file playback and timeshifting (a welcome addition), but no Ethernet port for home networking. Despite the AT2358ML's hi-def pretensions, the built-in tuner is Freeview-only; you'll need to add a separate set-top box to enjoy terrestrial HD channels. At least the tuner had no trouble picking up all the Freeview stations. Set up is straightforward, with an onscreen wizard guiding you through channel scan and other options (although quite why UK is sandwiched between France and Italy in an alphabetical menu is anyone's guess). Tweaking picture and audio settings is a little less user-friendly, as you're left to your own devices much of the time. The audio options include a five-point graphic equaliser, which seems possibly more hassle than it's worth at this level of the market. Pictures from the Freeview tuner are generally OK. BBC News 24 shows little in the way of mosquito noise and good contrast levels. Colours lack vibrancy, although for uncritical viewing you can boost them in the picture menus (in fact, most of the picture presets seem a little dark overall, but again this can be improved by upping the backlight in the Advanced settings). Unfortunately, Acer hasn't been able to cure the macro-blocking caused by Freeview's low bitrates. Switch to a hi-def Blu-ray and the picture performance improves. Even at this screen size the difference in resolution is noticeable. The Expendables is delivered with considerable aplomb, with plenty of fine detailing and sharpness, providing ample justification for having an HD resolution on a set of this size. The Acer's sound lets things down a bit – it's quite muffled, possibly because the speakers are downward-firing. Thankfully it's not too trebly and the Sound Effect mode does open up the soundstage. At full volume it does distort, but probably goes loud enough for most. The AT2358ML easily rivals screens from bigger brands in terms of features and connections and its design is certainly more alluring than most 23-inch sets. The sonics are a little underwhelming and Freeview pictures are prone to a few artefacts, but that PVR function makes it a great second-room choice, earning it a cautious thumbs-up.